At 1878 governor general Grigory Potemkin, one of Catherine the Great’s statesmen, erected painted facades of prosperous villages on the deserted banks of the Dniester River, where the convoy of the empress passed on its way to visit the southern parts of the country. On the summer of 2014, during the war/operation of Protective Edge, major general Yoav Poli Mordechai came up with the idea of building a field hospital for the residents of the Gaza strip next to Erez checkpoint. Over the years the term “Potemkin Villages” had come to mean hollow initiatives that are brought into this world in order to praise and glorify the initiator or the institution he serves. The Russian general initiated the staging of the setting of the villages so as to make his empress like him, while the Israeli major general did it to praise the IDF and enhance the conception that it is a moral army. The major general’s initiative received congratulations from the Chief of General Staff. In the publications made during those days it was said that there was an internal medical clinic, clinics for women and children, an ER and a pharmacy at the hospital. It was also said that interpreters were there to make the medical crew’s job easier. “We aren’t fighting the residents of Gaza” explained the Israeli UN ambassador. But the residents of Gaza didn’t see the reality the same way the ambassador did or the way the office of the IDF’s spokesman did. They, who had been attacked by IDF soldiers, injured and killed by IDF soldiers, and lost their homes and all they had because of IDF soldier, saw this hospital as a cynical exploitation of their situation. “What are they thinking? They shoot and kill us and we are supposed to kiss the hands that put bandages over the injuries they created and thank them?” a resident of the Strip said to me. “Even if I or one of my kids or relatives were injured during the war, we wouldn’t dare step out of the house, go out of the neighborhood and cross the line towards the soldiers to get to the hospital. Because if I tried getting there they would kill me while I was still on my way”. But the activity of the hospital wasn’t really meant for the residents of the bombarded Gaza strip. You can’t convince them that the army killing them and leaving thousands of them homeless and hopeless has good intentions. It was actually meant to get the international public opinion to favor Israel. But this was also difficult or even impossible to achieve, in light of the pictures and sounds that came out of the strip and portrayed the hard and bleak reality. In addition, while combat was taking place the Israeli and Palestinian co-ordinations continued. Patients who needed treatments or surgeries that couldn’t be provided for them at the hospital at the Strip, made it to Erez checkpoint on their way to the Palestinian hospitals at the West Bank and East Jerusalem. A friend of mine from the Strip said that once the IDF inaugurated the military hospital by Erez checkpoint, the patients had to first be hospitalized there and only then were they allowed to head on to East Jerusalem. My friend also spoke of one person, a man who was very ill, that in spite of his illness and of the fact that he had already headed on his way, upon learning that he must first go to the military hospital had waived the opportunity to received treatment and maybe recover, he refused and returned home. It must be noted that the spokesperson for the coordinator of government activities in the territories strongly denies that it was obligatory to pass through the military hospital before heading on. “The hospital operated from the 20.7.14 until the 26.08.14. The doctors working there were experts during the regular service. The thought of gathering information and writing about the military hospital designed for the residents of the Gaza Strip, came to me after talking to a dear friend of mine who lives in Gaza. I was hoping for a triangle, even if not an equilateral triangle- using the information given by the IDF spokesperson who is obligated to hand them due to freedom of information, the testimonies of the residents of the Strip and testimonies of soldiers. Unfortunately, up until the publication of this article not even one testimony had been given to the organization Breaking the Silence about this issue, and the triangle turned out faulty. A triangle with only two edges. 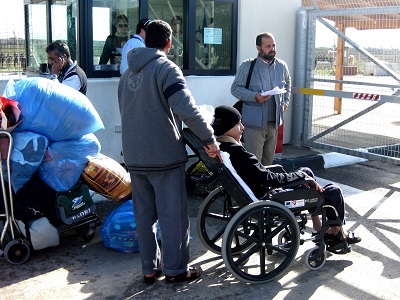 Seeing as Israelis didn’t have access to the Gaza Strip, the photo of Erez checkpoint that I enclosed is one that I took in the past, and in it is an ill person returning home to Gaza after receiving treatment in a Palestinian hospital in the West Bank.